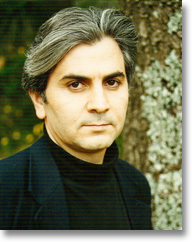 Firat Cewerî is a Kurdish novelist, short story writer, and a leading publisher, editor and innovator of contemporary Kurdish literature. He was born in the Kurdish part of Turkey and he began writing in Kurdish at a very young age. In order to be able to write freely, he left Turkey in 1980 and settled in Sweden. In that year, he published his first book in Kurdish Êrîş Dikin [They Attack]. He has been active within the Kurdish literary movement ever since, with 13 more books of his own, and a further 15 books translated, including works by Dostoevsky, Steinbeck and Astrid Lindgren. His Payiza dereng [Late Autumn] appeared in 2005, followed by Ez ê yekî bikujim [I’ll Kill Someone]. In 1992, he founded the literary magazine Nûdem [New Era], which continued in uninterrupted publication for ten years. Nûdem played a considerable role in the development of Kurdish literature and, as its editor, Firat Cewerî introduced and encouraged many new writers. He also edited the magazine, Nûdem Werger, devoted to literary works translated into Kurdish and, during the same period, founded Nûdem Publications, whose ventures included the reprint (in two volumes, 1146 pages) of all the back-numbers of Hawar [Cry], the 1930s journal considered to be the main instigator and forum for the modern movement in Kurdish literature. Firat Cewerî’s articles and short stories have been widely translated and have been adapted for cinema and theatre. He is a member of the Swedish Writers Union, a board member of Swedish PEN, and Chair of the Writers in Exile Committee.